The Weslo Cadence 255 DR treadmill is one of Weslo’s higher priced entry level treadmills. But just like all Weslo treadmills, this one also comes with very poor quality. If you want to save money on treadmills then this model, as well as other Weslo models, are worth investigating. These treadmills are some of the most affordable treadmills in the market today. However, as expected, they are not of good quality. So be sure to save some money for future repairs and replacements if you're going to buy one. 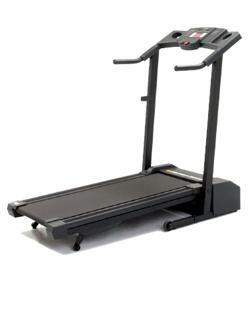 You’ll get a 2.0 THP impulse drive motor (not continuous duty) with this treadmill. This is capable of delivering speeds of 10mph and can be inclined for up to 10%. But due to its poor quality, I don’t recommend maximizing this machine's capabilities. It might not be able to handle the pressure of intense workouts. Other features include a workout fan, water bottle holder, space saver, and comfort cell impact absorption system. All of these were included to add more value to this treadmill. The biggest weakness of this model is its lack of quality. Also, with a $700 price tag, they should have added more features or at least have made it iFIT® compatible. I don’t recommend the Weslo Cadence 255 DR treadmill. I believe that there are other entry level treadmills out there that would give you more value for your money. See our best buy treadmills section or visit our Smooth 5.15P review. It is currently our best buy treadmill under $1,000.